Click here to read our guide to the cost of living in China. First of all, here you’ll find our guide on international flights to China (and domestic flights within China). The Bao’An International Airport is located 30 kilometers northwest of the city center. The easiest way to get there is to take Line 1 of the metro (Luobao Line) to Hourui Station, and then take bus M416 which stops just below the exit to the metro (the bus takes about 10 minutes to get to the airport). 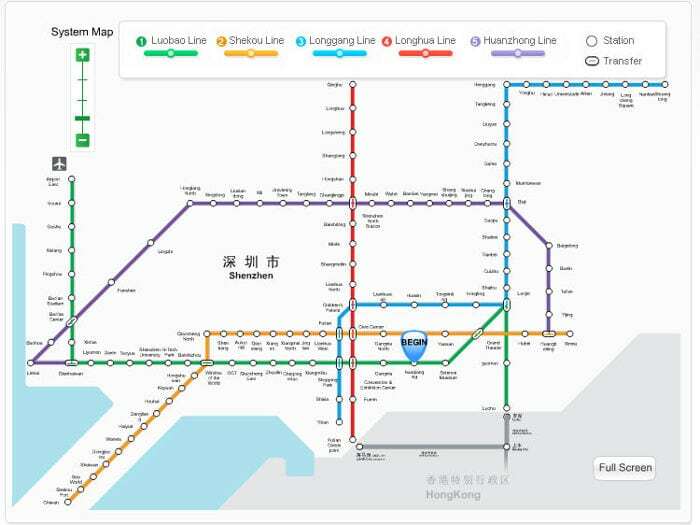 When Line 11 of the metro is finished, it will be possible to get to the airport directly via the metro (Line 11 will also serve as an express connection between Shenzhen and Hong Kong). Click here to read our guide on trains in China (and learn how to book a ticket online). Shenzhen Railway Station is located at Luohu, on the border with Hong Kong, and you get there using Line 1 of the metro (Luohu Station). This station serves as the main hub for connections in the Province of Guangdong. Long distance trains for Beijing, Shanghai and other cities beyond the Province of Guangdong (which for the moment leave from here), will in the future depart from Shenzhen East Railway Station. Shenzhen East Railway Station is located in Buji and you can get there by either Line 3 or Line 5 of the metro (Buji Station). It’s from this station that medium and long distance trains depart for the provinces of Sichuan, Hunan, Hubei, Jiangxi and Anhui. Moreover, this station will become the main hub for intercity trains in Guangdong Province. Shenzhen West Railway Station is found in the Nanshan district and can be reached via Line 1 of the metro (Liyumen Station). Even though this station was mainly conceived for handling commercial traffic, due to the reduced space at the Shenzhen Railway Station, over time many long distance trains were relocated here, including those for Lanzhou, Tianjin, Chengdu, Nanjing, Hefei and Jinan. Shenzhen North Railway Station is located in the Bao’An district and can be reached by Lines 4 and 5 of the metro (North Railway Station). This station serves as an interchange on the Express line Guangzhou–Shenzhen–Hong Kong and is the starting point for 11 lines, including the Shenzhen-Fuzhou-Hangzhou High-Speed Railway. The Shenzhen metro system is relatively modern and in continual expansion (at the moment there are six lines). Here you’ll find an interactive map that will let you choose your departure and arrival stations, telling you how much the ticket will cost (the minimum cost is 3 Yuan, which can go up to 9 Yuan depending on the distance traveled), and how long it will take to get to your destination. If you stay in the city for more than two days, instead of buying a token each time (yes, here the metro runs on tokens) I recommend you get the Shenzhen Tong Pass (深圳通), a contactless card that can be purchased and/or recharged in the service centers of metro stations, post offices or convenience stores (such as 7-Eleven) in Shenzhen. The card works like the Oyster Card in London or the Octopus Card of Hong Kong: at the time of purchase you will have to put 20 Yuan on deposit (which will be refunded when you return the card) and, other than avoiding the long lines at the automatic counters to buy a token each time, it will also grant you a 5% discount on the cost of the trip. Note that it is also possible to get the Hu Tong Xing, which is valid in both Shenzhen and Hong Kong, and works with two different currencies (Yuan and HKD). With almost 500 lines and nearly 10,000 buses, Shenzhen has and excellent city bus system. I must say that I personally prefer the metro and I’ve rarely had to use the bus in Shenzhen. To go deeper into the theme of transportation you can read our complete guide to the Shenzhen transportation system or our complete guide on how to cross the border between Hong Kong and Shenzhen. Shenzhen is located near the Tropic of Cancer and has a humid, sub-tropical climate influenced by monsoons. Winters are dry and mild (it never gets below zero), while the rainy season lasts from April to October. The monsoons reach their peak during the summer, when the climate is humid and reaches temperatures up to 35 degrees. Shenzhen is a megalopolis that, as you can see in the map below, extends horizontally. To give you an idea of the size, taking the direct metro line from Luohu (situated in the city center, to the border of Hong Kong) to the airport, which is located in the Bao’An district, will take about 90 minutes. When speaking of megalopolises, there is never a single response to the question “where’s the best place to live?” It simply depends on your lifestyle. In fact, your choice should take into account the following factors: where you work, your children (in which case your selection will likely have to do with the schools you choose), your need (or not) to live in a neighborhood with lots of expatriates, your propensity to enjoy the nightlife, and, given the particular situation of Shenzhen, whether or not you have to go to Hong Kong often. 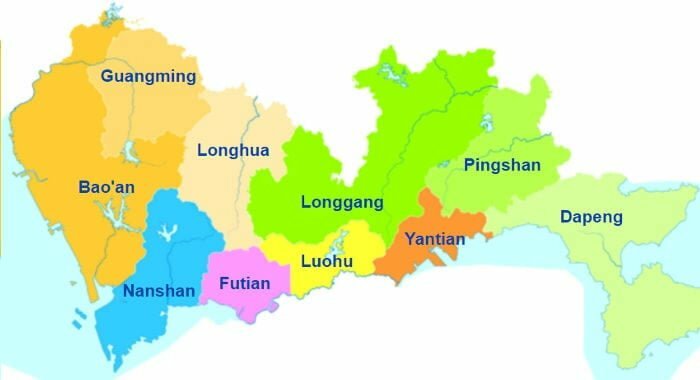 Note that the “expat” areas in Shenzhen are mainly Shekou, situated in the extreme south of the Nanshan district, OCT (Overseas Chinese Town) and Coco Park, both located in the Futian district. In my opinion, the most important factor is to live near a metro station, since Shenzhen’s metro system is excellent and allows you to reach all the main destinations quickly enough if you don’t live too far from the city center (Futian). The districts of Shenzhen’s city center – Map by Wikipedia.org (Creative Commons License). Futian is the government and financial district of Shenzhen. 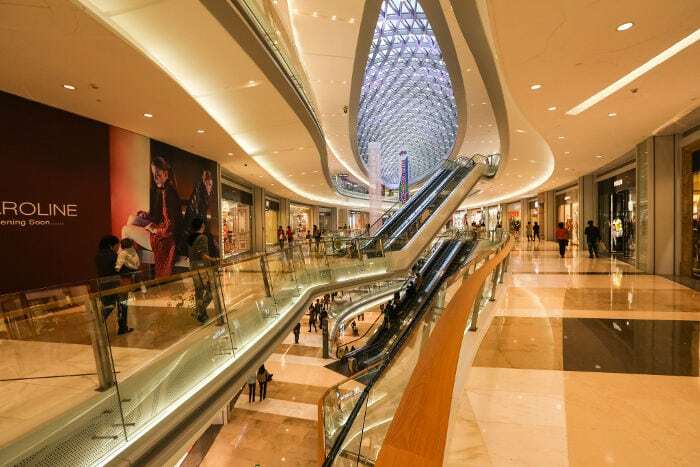 In Futian you’ll find an ample choice of schools (international or not), shopping malls and nightclubs. As I already mentioned, the areas with the highest concentrations of expatriates are Coco Park and OCT (Overseas Chinese Town), where you’ll find the most “renowned” apartments in the city. From Futian it is possible to enter Hong Kong via a pedestrian bridge (Futian/Lok Ma Chau Control Point). The Shekou quarter, which hosts about 40% of Shenzhen’s expatriate residents, is located to the south of the Nanshan district, which among other things holds a good number of the city’s tourist attractions. Shekou, originally the only area where foreigners could live, teems with restaurants, bards, clubs and “western-style” residential complexes. Aside from this, the majority of international schools and city universities are found here. From Shekou you can take a ferry to Hong Kong, Zhuhai or Macao. It is also possible to get to Hong Kong by bus (leaving from Shenzhen Bay Port). 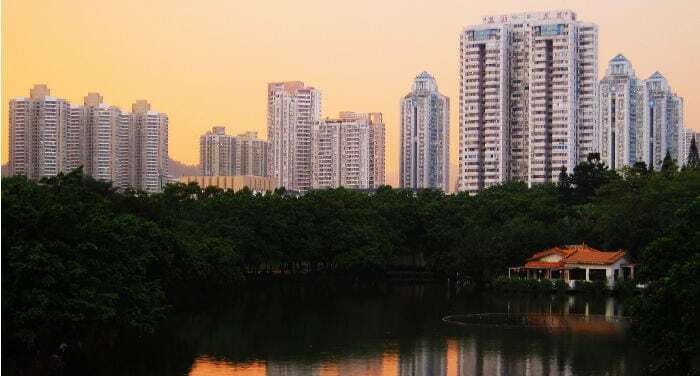 Luohu is the “oldest” district of Shenzhen, in the sense that when Shenzhen was granted the status of a city in 1979, Luohu became the first official district. For historic reasons, it is therefore the section of Shenzhen that most closely resembles “traditional” China. It is a neighborhood rich in shopping centers and nightclubs; apartments are however generally small and less modern than what you can find in Shekou or OCT.
It’s in Luohu, too, where you’ll find the most-trafficked border checkpoint between Shenzhen & Hong Kong. These are the two districts that are the most furthest from the city center. The main advantage is that the rents are definitely much lower. The disadvantage is that living far from the venter you will often be forced into rather long commutes. In addition, if you have children it will be more difficult finding a school to your liking. In these areas you’ll find far less expats, but that may be considered either an advantage or disadvantage depending on the person! If your priority is living right near the beach and you don’t mind living far from the city center, then this is the neighborhood for you. This article is particularly dedicated to the practical aspects of the city; to learn more about the main tourist attractions of Shenzhen I recommend that you read this article. In addition, here you’ll find tourist information on the surrounding cities of Hong Kong, Macao, Guangzhou and Zhuhai. To conclude, here you’ll find our reviews on the best luxury and budget hotels in Shenzhen. First of all, if you’re thinking about traveling to or moving to Asia without a health insurance policy, think again. In the event that you have a health issue, no hospital or clinic will accept you unless you can pay in cash or are covered by a policy. Click here to learn more about insurance for short stays and here if your intent is moving there to live. When it comes to nursery schools, elementary, intermediate and high schools, you’ll have three choices: the first is to enroll your child in an international school. In Shenzhen you’ll mainly find schools that offer American or Britain curriculums. The pros of international schools are many, the top one being that the teachers are generally better prepared and their classes have a limited number of students (10-20 students per class). The main disadvantage is the price, since we’re talking about rates of about 15-20.000 Dollars a year. Here you’ll find a rather complete list of international schools in Shenzhen, some of which are bilingual (English and Chinese). Private Chinese schools are cheaper compared to international schools. Moreover, those studying in schools will learn both Chinese and English. The disadvantages are that to be accepted you’ll need to have an “elevated” level of Mandarin before enrolling, and classes are larger (20-30 students per class). Public schools are generally free. There are nevertheless a few problems. The first is that to be admitted you’ll need to have Chinese citizenship. In addition, the teaching is done primarily in Mandarin (so if you want your child to also learn English this is a less than ideal choice), the teaching style is traditional Chinese (which certainly doesn’t encourage creativity), and the classes are much more “crowded” (about 50 students per class). Even if it’s now home to more than ten million inhabitants, Shenzhen is a very young city (considering that in the 70’s it was still a fishing village). So the city doesn’t have a university to compete with the “historic” Chinese universities, such as Peking University or the Shanghai Jiao Tong University. On the contrary, many of the universities were born as collaborations with universities of other cities interested in making the most of the potential of the most dynamic city in China. Founded in 1983, Shenzhen University is found in the Nanshan district, has two campuses (Houhai campus and Xili campus) and about 35,000 students. Founded in 2001, Peking University Shenzhen Graduate School represents a partnership between the already-cited Peking University (the most prestigious university in China) and the municipal government of Shenzhen. The university is located inside the Shenzhen University Citadel, which also hosts the Graduate School in partnership with Tsinghua University and the Harbin Institute of Technology. Founded in 2009, despite its young age and reduced number of students (less than 2,000), the South University of Science and Technology of China is considered an innovative university and worthy of consideration if you intend to study in Shenzhen. Click here to see a complete list of universities in Shenzhen. If you’d like to buy western brand merchandise, I recommend Carrefour. Here you’ll find a complete list of the Carrefour locations throughout the city, including the addresses and directions on how to get there. To register your address (the procedure is obligatory unless you live in a hotel), you’ll have to go to the Public Security Bureau in your area (it requires your landlord’s address or the agency that rented you the room/apartment). Internations is an excellent website for anyone hoping to meet people with similar interests, participate in events to meet other expatriates based in Shenzhen, or simply find specific information on the city. MeetUp is a website for those looking to meet others with similar interests, from bowling to tango to chess. eChina Cities is a mix between a magazine, city resource directory and a forum, active in all major Chinese cities.